Volcanic activity in the area goes back at least three million years. About 600,000 years ago, contemporary with the formation of nearby Mount Shasta, a series of large eruptions formed a huge volcano, Mount Tehama. Just to put it into perspective, the largest of these eruptions was about 50 times as powerful as the 1980 eruption of Mount St Helens or five times that of Mount Pinatubo. Mount Tehama was immense. At its base, it measured 18 km (11 miles) by 24 km (15 miles) wide and it stood more than 3,353 m (11,000 feet) tall. Its total volume must have been well in excess of 400 cubic kilometres, a rough calculation yields a volume of 425 cu km, comfortably larger than either present-day Mount Shasta or Mount Adams, both of which have volumes of about 350 cubic kilometres. Activity at Mount Tehama continued for about 200,000 years and consisted mostly of pyroclastics and andesitic lava flows containing olivine. During the same period of time, other volcanic vents began to appear such as the shield volcanoes Raker Peak, Red Mountain, Prospect Peak and Mount Harkness. The distances from the central volcano, never more than eight miles, argues that they were satellite vents of Mount Tehama. As for the central volcano itself, there was a final, large lava flow on the north-eastern flank consisting of glassy dacite and further dacite flows formed smaller cones such as Mount Conard and Diamond Peak on the flanks of Mount Tehama. Subsequent glaciation combined with extensive hydrothermal activity led to major erosion and to a subsequent collapse of Mount Tehama of which today the only visible, large remnant is Brokeoff Volcano, also known as Brokeoff Mountain. The collapse structure, a caldera about 3 km (2 miles) in diameter, was quickly infilled by debris and material from later eruptions. Further activity built more than thirty other cones which are sometimes referred to as the Lassen Domes. As we have already seen, Mount Tehama began life as a rather typical andesitic stratovolcano, but subsequent activity became more and more silicic. After its collapse and disappearance, local volcanism shifted to what had been its northern flank. The last 400,000 years have seen at least three known lava flows, parts of which can be seen on or near Raker Peak and Mount Conard. There is also evidence of a very large explosive eruption which ejected an estimated 50 km3 (12 cubic miles) of material and created a large crater which was soon obliterated by subsequent lava flows and emplacements. During this period, a further twelve lava domes were emplaced throughout the Park area. The next period of eruptive activity spanned some 50,000 years and ejected between 15 to 25 km3 (3.5 to 6 cubic miles) in the form of pyroclastic flows, viscous lava flows and mainly dacitic lava domes. About 27,000 years ago, Lassen Peak started to form as a mound-shaped dacite lava dome pushed its way through the shattered north-eastern flank of Mount Tehama. As the lava dome grew, it shattered overlaying rock, which formed a collar of angular talus around the steep-sided volcanic dome. Lassen Peak reached its present dimensions of nearly two km across at the base and prominence of 606 metres above the surrounding landscape in a remarkably short time, probably in just a few years or at most tens of years. From 25,000 to 18,000 years ago, during the last glacial period of the current Ice Age, the shape of Lassen Peak was significantly modified by glacial erosion. The bowl-shaped depression – cirque – on the volcano’s north-eastern flank is the result of erosion by a glacier that extended some 11 km (7 miles) from the dome. To inject a piece of human history, Lassen Peak was named after the Danish blacksmith Peter Lassen (most likely an Americanisation of Larsen), who guided immigrants in covered wagons past this peak into the Sacramento Valley during the 1830s. The trail that Lassen blazed never found general long-term use because it was considered to be unsafe. Just over 1,000 years ago, a major period of activity resulted in the extrusion of five dacite lava domes that form the 177 metres high Chaos Crags. Initially, they must have been considerably higher as a major rockslide occurred just 300 years ago. Riding on a cushion of compressed air, the sturzstrom landslide travelled 20 to 30 times the vertical fall height and resulted in the formation of beautiful Lake Manzanita, 3 km (2 miles) from the Chaos Crags. The most recent period of activity at Lassen Peak took place between 1914 and 1921. After 27,000 years of dormancy, Lassen Peak was shaken by a steam explosion on May 30th, 1914. By mid-May 1915, more than 180 steam explosions had gouged out a 300 metre-wide (1,000 ft) crater near the summit. On the evening of May 14th, 1915 the character of the eruption changed dramatically as incandescent blocks of lava could be seen bouncing down the flanks of Lassen Peak from as far away as the town of Manton, 30 km to the west. Next morning, the crater had been filled by a rapidly growing dacite lava dome. Late in the evening of May 19th, the lava dome was fragmented by a large hydrothermal explosion. Glowing blocks of lava fell on the summit and snow-covered upper flanks of Lassen Peak and launched an 800 metre (half mile) wide avalanche of snow and volcanic rocks that roared 10 km (6 miles) down the volcano’s steep northeast flank, over a low ridge at Emigrant Pass and into Hat Creek. The lahar was deflected north-westward at Emigrant Pass and flowed more than 11 kilometres (7 miles) down Lost Creek. During the night of May 19–20th, dacite lava slightly less viscous than that which erupted on the night of May 14–15th, welled up into and filled the new crater at Lassen’s summit, spilled over low spots on its rim, and flowed 300 metres (1,000 ft) down the steep west and northeast flanks of the volcano. At 4:30 p.m. on May 22nd 1915, Lassen Peak exploded after two quiet days in what is referred to as “the Great Explosion”. The eruption column rose more than 10,000 metres (30,000 ft) and was visible from as far away as the Pacific coast 240 km (150 mi) to the west. The blast created the larger and deeper of the two craters seen near the summit of the volcano today. Pyroclastic flows devastated an area of 8 km2 (3 sq miles) below the volcano, and melting snow created a series of lahars that rushed nearly 16 km (10 miles) down “Lost Creek” to the Old Station. The lahars released large masses of water that flooded the lower Hat Creek Valley a second time. A layer of volcanic ash and pumice was traceable for 25 miles (40 km) to the northeast and fine particles of ash rained down as far away as 320 km (200 mi) to the east. For several years after the main eruption, rainfall triggered steam explosions indicative of fresh lava just below the surface, and in May 1917, a series of vigorous hydrothermal explosions obliterated the two older craters and dug out the second of the two summit craters visible today. It was not until 1921 that the eruptive period was officially declared over. Impressed to learn that Lassen Peak erupted after 27000 years of dormancy, in 1915. That´s why an awakening. And also quite a strong eruption. From all Cascade volcanoes, Mt Shasta and Mt St Helenes are the most active ones…. From Wikipedia… With the exception of the 1915 eruption of remote Lassen Peak in Northern California, the arc was quiet for more than a century. Then, on May 18, 1980, the dramatic eruption of little-known Mount St. Helens shattered the quiet and brought the world’s attention to the arc. Geologists were also concerned that the St. Helens eruption was a sign that long-dormant Cascade volcanoes might become active once more, as in the period from 1800 to 1857 when a total of eight erupted. None have erupted since St. Helens, but precautions are being taken nevertheless, such as the Mount Rainier Volcano Lahar Warning System in Pierce County, Washington. Can eruptions be linked to major earthquakes along the Cascade region? Actually, I’m not so sure about that 27000 years of dormancy. 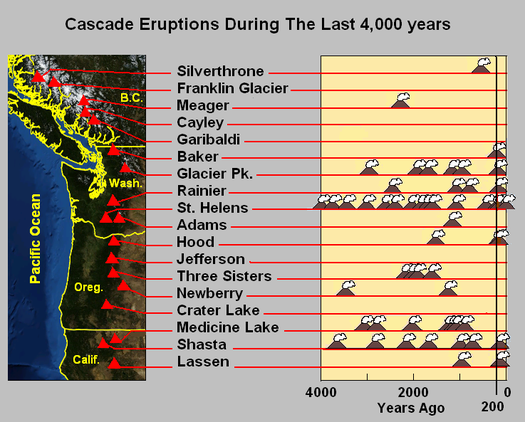 If you consider the Lassen system as a whole, then the Chaos Crags eruption(s) round about the 11th Century give a more ‘conventional’ 1000 years of quiet. As shown on the chart above, I noticed! The 27000 year figure is for Lassen Peak itself. As a whole, the pre-1914 repose period was actually about 350 years. 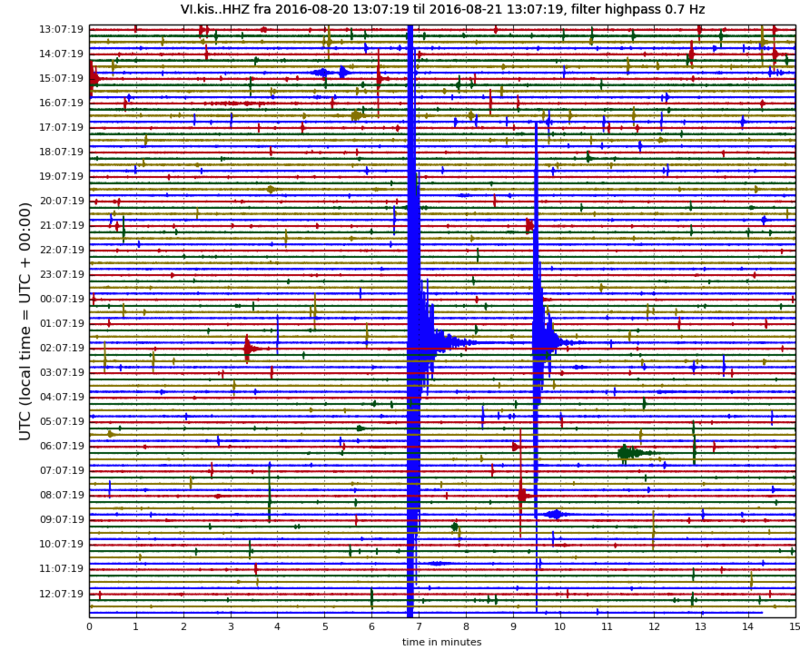 According to the GVP there was a VEI 3 eruption in 1666 at the vent called Cinder Cone. Before that, was a repose of about 700 years. There were most likely many eruptions in the late Pleistocene and throughout the Holocene, but that entire period seems to be undocumented. I agree, which is why the name of the article is Mt Tehama (etc) and not Lassen Peak. This system is very interesting because at the moment it does not have a central volcano. Long repose time. Smaller explosive eruptions. Lahar. Lava flow. Then a big explosive eruption, with pyroclastic flows. That sequence sound familiar? It looks like the 1915 eruption of Lassen Peak was the template for the sequence of events in the movie “Dante’s Peak”. Add in Lassen having features near it with “hell” and “devil” in the name and it seems even likelier to have been the inspiration. Though, the visuals of the mountain before and after exploding seem to have been based instead on St. Helens. When we look at EQ table, what does it mean depth 0.1Km ? and +/- km error? The second question how do you make the distinction between ice quake and EQ between these values? It’s not relative the actual surface but a mean depth (which if I recall correctly is sea level). Ice quakes will show up on the automated solutions (less than 99.0% quality) but will be removed by an IMO seismologist once he/she checks them. This means that quakes with a 99.0% quality are not “ice quakes”. The depth is measured relative to the level of the location of the detectors. In Iceland, this is largely (but not always?) sea level. 0.1 km means sea level or higher. I am not sure whether the system can distinguish quakes from higher than that level from those below that level. It assumes it is always lower. Minor ice quakes from glacial movement, which tend to have M0-1, are removed. Reading the literature, major vertical ice falls can show up as larger earthquakes. There was a swarm in chateau d’Oex (source SED/ETH) – tectonic 🙂 – and see depth with negative value. Note sure what’s the meaning of these values. An obscene number of years ago, I was fascinated by a Worldbook encyclopedia article with trancparency overlays detailing the Cobb seamount hotpot and the hypothesized subduction feed to Mt Ranier. Per that article, it was the most likely to reactivate. 10 or so years later, St Helens goes pop. The International satellite cloud climatology project shows a 5% decrease in cloud cover between 1991 and 2003 (that explains two thirds of the warming trend in the sat record) Once correctly accounted for there is no statistically significant trend in warming that can be attributed to CO2. Back to volcano talk please. If you don’t think there’s a significant relationship between climate change and volcanic activity you need to go read some papers; this is very much on-topic. Climate can very clearly force volcanoes. There’s a recent article explaining how the 1991 Pinatubo eruption has “masked” the warming trend, which makes sense if you think about it. Better to quote the full text, otherwise you may draw unintended conclusions. The IPCC has high confidence that a doubling in CO2 (that is, a CO2 concentration of around 540 ppm; we are currently at 405ppm or so) will cause a temperature increase between 1.5 and 4.5C. The footnote refers to that range. Discussion of the science background is fine, but when disputing facts it needs to be done with good arguments. July 2016 was the warmest month every measured. The warming over the past five years has been happening at a frightening speed. Next year will probably be not as hot as this year, and the warming should settle again at the average rate of 0.1 degree/decade. That is a rate where policy makers need to make urgent preparations. A simple example: malaria will become established in southern Europe, as far as southern Germany. You need prevention strategy (noting that many pesticides are banned) and treatment centres. In the US, corn yields will go down and rice may become an option. That means changing the subsidy schemes, a change that takes time. There is a reason the IPCC produces policy documents. What it impressive (and scary) is that climate warming has accelerated in last few years, not just in 2016 (which was clearly due to El Nino). It is just a matter of seeing which volcanoes are losing faster their ice caps. Snaefellssjokull is one of them. Tindfjallajokull also. Langjokull has been decreasing quite quickly. But I think the effect goes delayed and the delay might be a few centuries even. Two of the recent deglaciated volcanoes include Askja and Torfajokull. Another way to look at this. The Dutch weather service calculates a ‘heat number’ for each summer. It is the sum of all daily average temperatures above 18C. (A days with an average temperature of 20C would counts as 2, one with 16C would not count at all.) It is a bit of a funny number, but one way to look at it is counting days with evenings warm enough to comfortably sit outside. The current, rather poor, summer has a heat number of 67.6 (this will probably go up a bit this week, but often late August doesn’t contribute much because days are getting shorter.) In the records, before 1950 only 1911, 1941 and 1947 had a higher heat number. This poor summer would actually have been exceptionally mild a century ago. Since 1980 (when warming first began to exceed natural variability), 12 summers of the 36 had a lower heat number. Of these 12, 9 were before 1998 (the midway point) and 3 after. So the current summer would have been exceptionally mild in the period 1900-1950, precisely average in 1980-1997, and in the poorest 20% in the period 1998-2016. The warming has gone that fast. Now the task of a climate scientist is to test whether these measurements themselves were identical between a century ago and now. For instance, nowadays we measure temperatures hourly. A century ago it was done five times a day. Build-up areas act as heat islands, trapping warmth: are the measurements done away from such heat islands or affected by it? (Nowadays we tend to use airports, away from build-up areas. You should be careful comparing old inner-city data with new airport data.) Measurements stations may have moved (in the case of the Dutch weather service in de Bilt, a new station was put up in May 1950, and over the next year moved a number of times, further away from some growing trees). Trend analysis may show sudden changes. For the de Bilt station, a change was seen around 1920 probably due to a change in thermometer being used, and in 1967 when nearby trees were cut. You use comparison data from nearby stations to determine the effect of all these on the measurements. The published values should be the raw data, the measurements as reported at the time, and the corrected values, so if people disagree with the corrections they can apply their own values. The IPCC has to check all reports for such biasses and corrections made for it. It is a difficult task but their conclusion is that the data is compelling. The warming since the 1980’s is based on uniform, well sampled data and is difficult to dispute. The older comparison data requires careful analysis. A new Bard star. M3.2 at 2.7km depth followed by an M1.9. Since I get to look at Mt. Shasta and Mt. Lassen near everyday, I have a new appreciation of what exactly it is I’m looking at, and how it got there. Other “general” information resources like Wikipedia, GVP, etc. all have their strengths, but these articles are a wonderful addition to my personal library. Because of the lack of activity in the 0.5 – 1.0 Hz band (red) where magmatic movement usually shows up, it is most likely a hydrothermal event (which of course signifies an influx of magma into the hydrothermal zone) or, less likely, a small jökulhlaup. We’ll keep you posted! Cam has updated; probably was just clouds. A small jökulhlaup has started from Grimsvötn and will flow in to Gigjukvisl. It is estimated to be a small one – similar to the one in 2015 which was one of the smallest jökulhlaup that has been witnessed.